6-weeks of mastery-level online training. You’ll learn advanced strategies in developing your psychology, physiology, productivity, and persuasion skills. You can take the training at your own pace, and you have access to it for LIFE. Each week’s training is 1-2 hours of video, and includes worksheets and journaling activities you can complete at your own pace anytime. 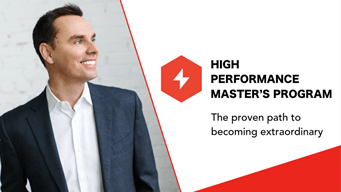 Brendon’s private client “high performance plan,” which details the habits and routines you need to implement in order to dramatically improve your well-being, relationships and career. He only gives this to $50k consulting clients, but he’s giving it away as a bonus to signups TODAY. The high performance “intervention kit,” full of audio coaching from Brendon to help you deal with real-life tough obstacles and challenges. Have a fight with your spouse, a disappointing day at work or major set back, a huge dream that you don’t know how to begin? Yep, there’s an audio program for that. 2 tuition-waivers to a LIVE High Performance Academy seminar. There are two live seminars per year and you get to choose which you want to attend. Our next event is in Phoenix, AZ, March 22nd-25th, 2018. If you choose to attend, you’ll register separately and pay a one-time $97 materials fee for you and your guest. NEW BONUS! Access to Brendon’s NEW High Performance GPS Course. Advanced goal attainment strategies, priority evaluation techniques, and scheduling systems for rapid progress and growth.